Following the discovery of gold in California in 1848, Mills set out with the necessary money to begin a merchandising or banking business. Upon arriving in San Francisco in 1849, Mills at once established a trading business buying gold dust, selling goods and dealing in New York exchange. His success led to the formation of the Bank of D. O. Mills & Co. in 1850 which thereafter led to the accumulation of a large fortune. 1890, New York. Stock certificate for 192 shares. Brown/Black. 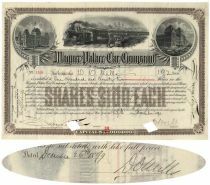 A choice multi-engraved certificate depicting a steam locomotive hauling Wagner cars flanked by building scenes. This company came into existence as a result of a reorganization of the New York Central Sleeping Car Company in 1865 which had manufactured Webster Wagner's widely popular sleeping cars exclusively for the New York Central Railroad. The company manufactured both sleeping cars and drawing-room cars, later incorporating some of the Pullman companies innovations by contract with the company. Issued to and signed on verso by Darius Ogden Mills (1825-1910). Merchant; Banker; Philanthropist. Following the discovery of gold in California in 1848, Mills set out with the necessary money to begin a merchandising or banking business. Upon arriving in San Francisco in 1849, Mills at once established a trading business buying gold dust, selling goods and dealing in New York exchange. His success led to the formation of the Bank of D. O. Mills & Co. in 1850 which thereafter led to the accumulation of a large fortune. Diamond cut cancellations at officers' signatures. Very Fine.